The most recent global oil supply-demand news is mixed: demand has increased in India; the continued weak dollar heralds higher oil prices; Canadian oil sands production shut down due to fires is reopening; Libyan production is lower; US production has fallen 1 million barrels per day (MMBPD) below its level of a year ago; insurgents in Nigeria announced their intent to destroy all of that country's oil production; and oil service companies have pulled out of Venezuela because they are not being paid. The expected loss of 1 MMBPD from Nigeria alone in May would appear to start resolving the 1.4 MMBPD of daily oversupply. But meanwhile, Saudi Arabia and Iran are producing all-out to grab market share. Recent Saudi oil pricing changes have been strategic: slightly lower in Europe, higher in the US and Asia. 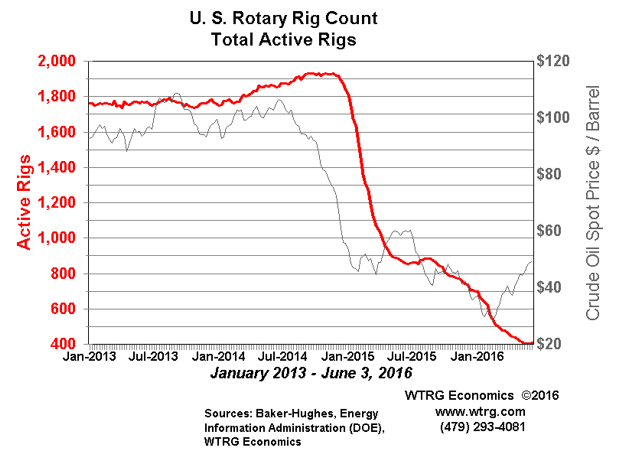 The graph above shows the lagged correlation between oil price and US rig count, with a temporary divergence only in the last few months. This SEE detailed analysis considers one of the key oil service sectors: sand and proppants. For more on this topic log in now or, if you are not already a subscriber, subscribe now. Copyright 2016, Starks Energy Economics, LLC. This information may not be disclosed, copied or disseminated, in whole or in part, without the prior written permission of Starks Energy Economics, LLC. This communication is based on information which Starks Energy Economics, LLC believes is reliable. However, Starks Energy Economics, LLC does not represent or warrant its accuracy. This communication should not be considered as an offer or solicitation to buy or sell any securities.